If Tokyo is all about looking up—taking in flashing billboards, buzzing pachinko halls, and rowdy second-floor cocktail bars—Kyoto is all about looking in. It’s a bit quieter and much smaller, but what Kyoto lacks in size, it makes up for in perfection. There are few places in the world with such intense dedication to craft, beauty, and history. As Japan’s capital until 1869, the city boasts a royal history: Kyoto is filled with temples, shrines, palaces, and gardens. Additionally, Kyoto was the birthplace of many revered Japanese art forms, as well as some of the country’s best cuisine and sake. Although exploring Kyoto thoroughly could take months, if not years, it’s possible to get a taste of this peaceful city in just a few days or a week. Below you’ll find AD’s favorite places to stay, shop, and eat in Kyoto. 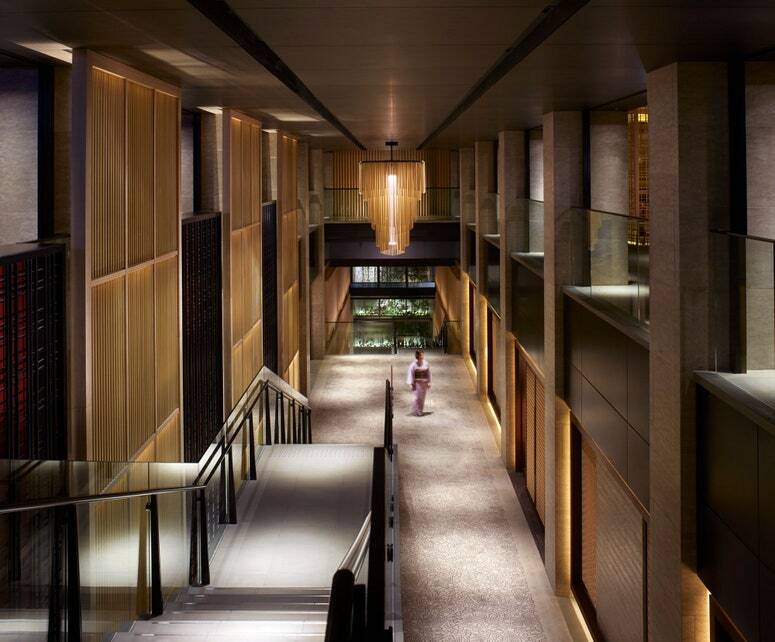 If you’re looking to combine the tranquil atmosphere of a Japanese ryokan with the opulent luxury of a big-city hotel, look no further than the Ritz-Carlton, Kyoto, opened in 2014. Situated on the banks of Kyoto’s Kamogawa River, the hotel has many rooms that overlook the Higashiyama Mountains. The 134 spacious rooms, among the largest in the city, embody the Japanese principles of hana (beauty) and nagomi (calm) and showcase classic design details like Japanese lacquer furniture and shippō headboards, a variation on cloisonné. The hotel also offers an exceptional selection of free activities, including morning running and cycling tours that offer visitors a chance to visit many of the city’s most famous temples free of crowds, and classes such as origata, the unique Japanese art of gift-wrapping. A guide on Kyoto dining alone would be endless, but there are a few standouts worth seeking out. Truly, it’s hard to find bad food in the city, though, so if you find yourself wandering in and out of shops all day without a meal, don’t hesitate to pop into the nearest machiya (wooden townhouse) that looks welcoming—with any luck, you’ll discover a smiling chef ready to serve a piping-hot bowl of yudofu for just a few bucks. If you want to experience kaiseki, a traditional Japanese tasting menu, there is no better city than Kyoto. Ishibekoji Kamikura in Gion allows you to sit at the nine-seat chef’s counter, where you’re served a progressive meal of contemporary dishes using Japanese ingredients. On any night, a meal may include wagyu beef, blowfish sashimi, and other delicacies. For tempura, the Michelin-starred Tempura Mizuki serves a vegetable- and seafood-focused menu, with each ingredient encased in a delicate batter and fried in safflower oil. Vegetables are primarily local, and seafood is from nearby Setouchi. For a quick snack or to see the bounty Kyoto is known for, stroll through the historic Nishiki Market. 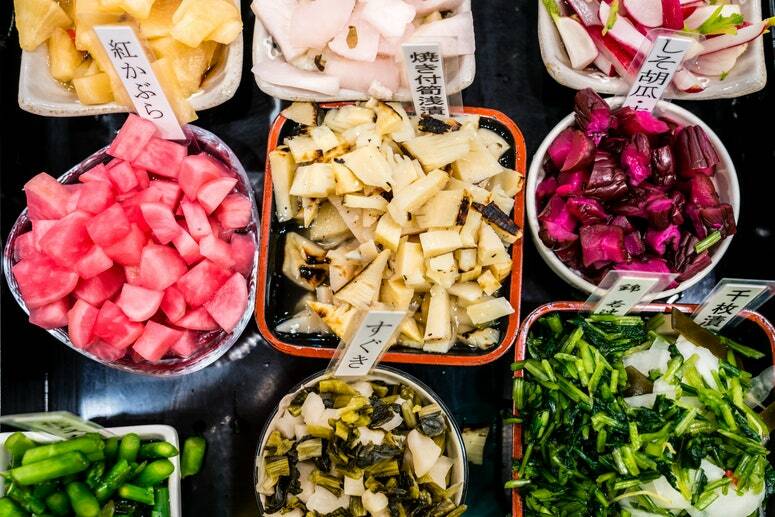 Though the 400-year-old market has grown more touristy in recent years, there are few places anywhere in the world that offer such a diverse assortment of foods. Many stalls specialize in just one item and have for generations. 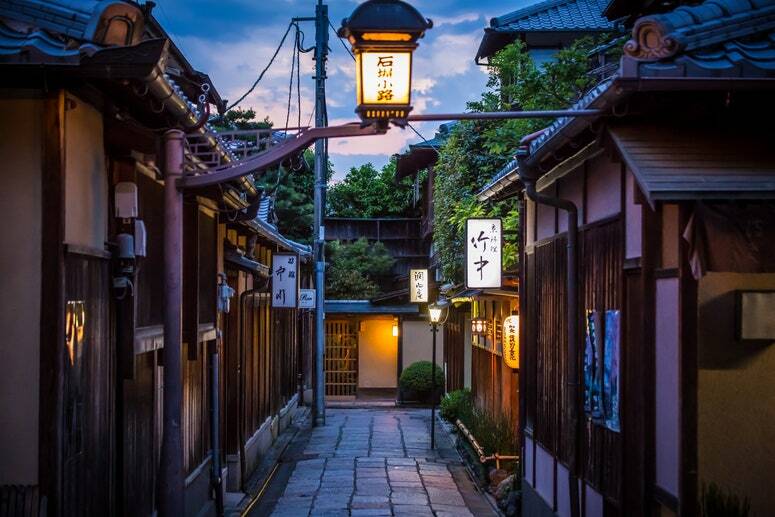 Kyoto’s drinking culture is more subdued than Tokyo’s, but that means it’s easy to stumble into magical bars that feel like they were torn from the pages of a Haruki Murakami novel. Jazz Spot Yamatoya is one such place. Open for 49 years, the bar serves a select menu of whisky, cocktails made with Japanese gin, and remarkably good pour-over coffee, set against a background of old jazz records. Unlike Tokyo, Kyoto’s streets are mostly neatly organized in a grid, which makes exploring easy. While the city lacks Tokyo’s extensive subway system (there are just two lines), buses are plentiful and taxis are much less expensive than in the capital. 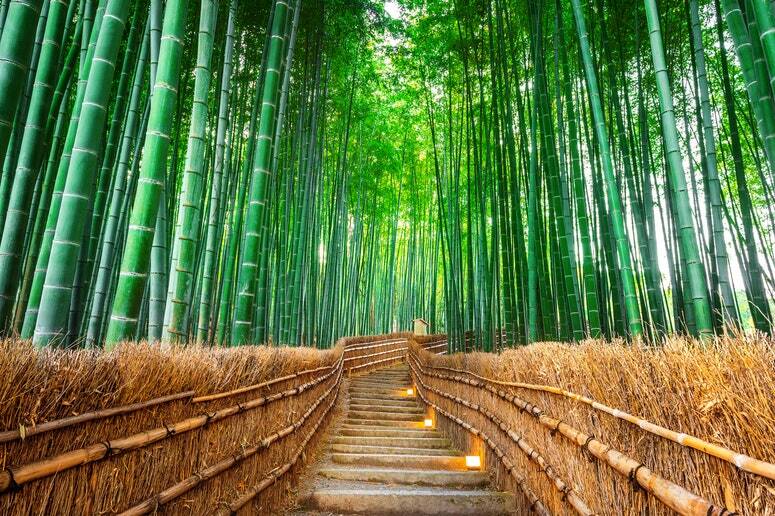 Start at the famed Arashiyama Bamboo Grove on the western edge of the city. It’s a popular spot for Instagrammers, and rightfully so. Even the sounds here are iconic: The Ministry of Environment included the whistling bamboo as one of the country’s official soundscapes. The grove is also located within close walking distance of many temples and shrines, but among the most beautiful is Jojakko-ji, at the base of the Kokura-san Mountain. This quiet temple was built in the late 16th century and features a distinctive pagoda, stunning landscaping, and some of the best views of Arashiyama and Kyoto below. It’s also not on most tour stops, which makes it a good place to truly enjoy an hour or two of serenity. 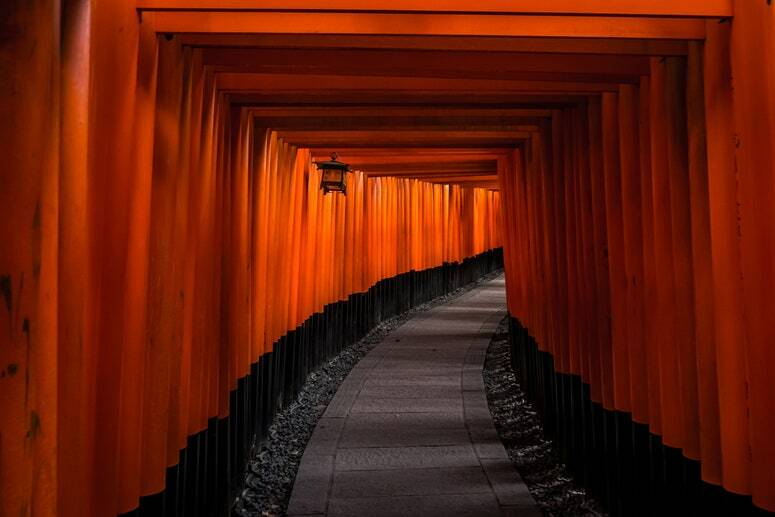 Another iconic stop in Kyoto is Fushimi Inari-taisha, the head shrine of the god Inari. Set at the base of an eponymous mountain, the shrine is best known for the thousands of orange torii gates that line the path. A trip to the top will take about two hours. Kyoto is known for remarkable handicrafts, including pottery, folding fans, umbrellas, and lacquerware. It’s easy to find many of these things at the city’s department stores, but it’s grown increasingly difficult to find small-scale producers. But they do exist—and many have been plying their craft of choice for hundreds of years. To see the largest selections of arts and crafts in one place, visit the Kyoto Handicraft Center. Spread across seven floors, this large complex has everything from key chains to hand-painted fans and swords. If you want to learn a craft, the center offers workshops that include woodblock printing and shichimi spice blending. For bamboo items, seek out Kohchosai (there’s another branch in Osaka). The company was founded in 1898 and is well known for beautiful, yet useful, items made from the plant. Products include hand-woven baskets, kitchen utensils, and even minimal storage containers. Any chef knows that the Japanese knife-making tradition produces some of the best cutlery in the world, and one of the most esteemed brands is Aritsugu. Founded by Fujiwara Aritsugu in 1560, the company is one of Japan’s oldest knifemakers. They sell more than 400 different types of knives out of their Nishiki Market shop. The store is friendly to visitors, and you’re welcome to try out the various types before deciding which one to take home. Much of Kyoto’s great shopping can be found on Teramachidori, a broad avenue lined with boutiques. Tucked among them is Muku, a cozy shop that sells Japanese decor and gifts, but also carries a wide selection of contemporary clothing made in Japan, such as an assortment of Japanese socks and lightweight cotton pullovers and dresses made in Osaka.